Members of the society as well as non members are welcome but booking is essential as we are already over 50% booked. The majority of the meeting will be questions and answers from the audience so you can find out the reality of the future of our green belt. 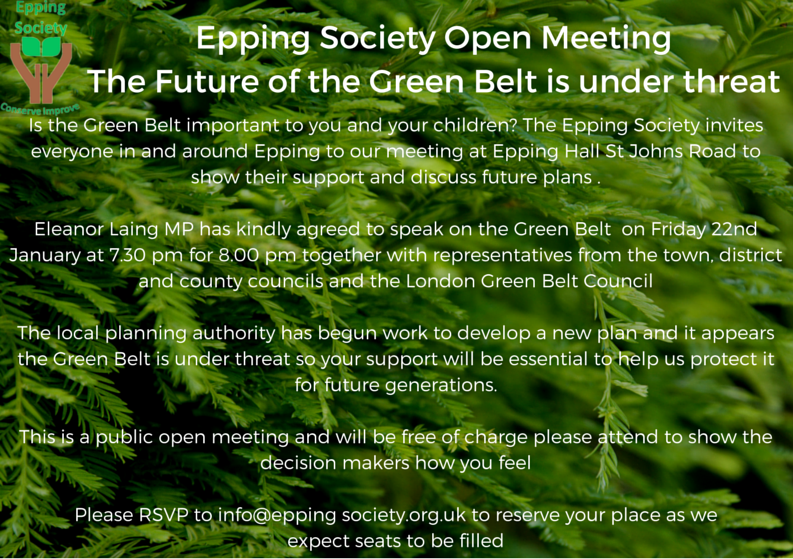 We would like to attend the meeting regarding The Future of the Green Belt at Epping Hall on Friday the 22nd January. 2 places please Mr and Mrs Roger Stevens. Many Thanks. Eddie and Maureen Crossley, may we reserve two seats for tonight’s meeting re Green Belt. I would like to attend the meeting on the 22nd January at Epping Hall regarding the future of the green belt. Thank you.